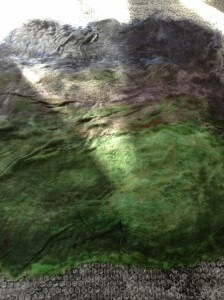 So there I was, in Greenweeds’ (www.greenweeds.co.uk) studio in Aberystwyth, with a Groovi Felting Machine and a load of Merino Batts. Could I fail to make some fabulous felt? 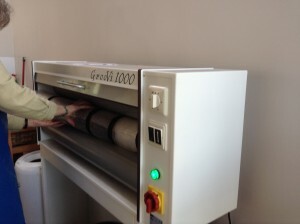 Indeed, if the Groovi Felting Machine lived up to its hype, would I have to do anything at all apart from drink coffee, eat cakes and watch it perform miracles?Last year, I met a Felt Purist. She asked me how I’d made the felt for my piece of artwork entitled ‘Footfall’. ‘Same way as always,’ I answered. ‘I tacked a load of fleece onto a piece of fabric, rolled it up in a pillow case and chucked it in the washing machine.’ The Felt Purist told me that I couldn’t do that. I looked at ‘Footfall’ and said that not only could I do it, but I had done it. You can see the result yourself. This was done on a piece of bubble wrap. The batts were covered with old net curtain and everything was rolled up around a foam tube that was about a metre in length. 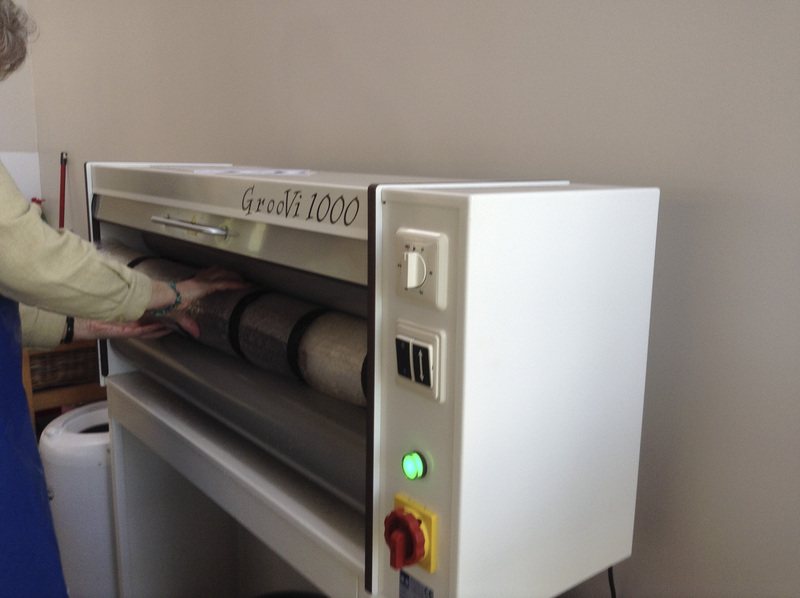 The bubble wrap, batts and curtains were then secured in place using Velcro straps and the whole thing placed in the Groovi Felting Machine. 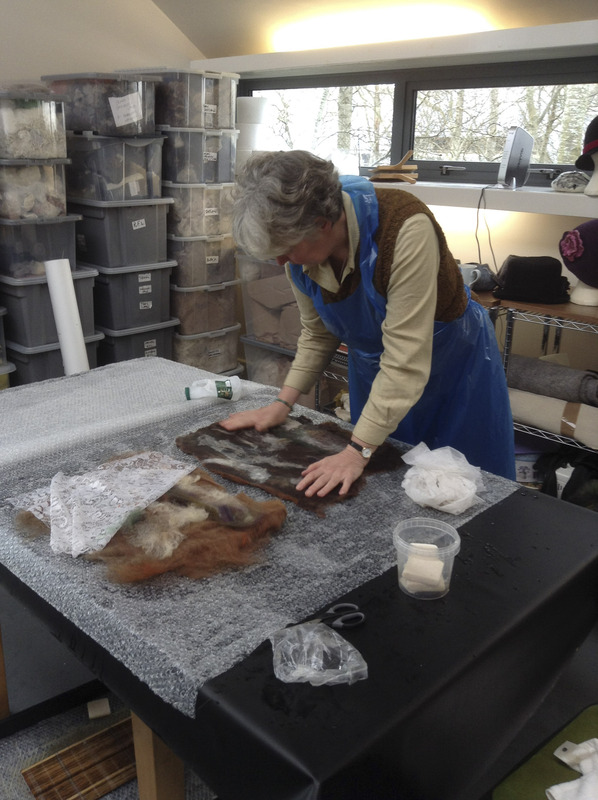 Once this was done, the timer set and the door closed, the felting process took about 25 minutes which was just enough time for me to get the next piece of bubble wrap, arrange the batts, cover with net curtains and roll up around the foam tube. 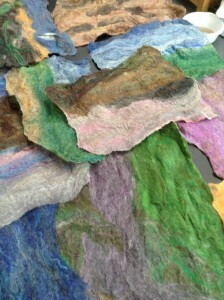 In went fluffy Merino Batts and out came pieces of felt which would be perfect backgrounds for my style of Textile Art. 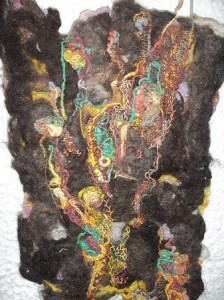 You can see more of my work here. 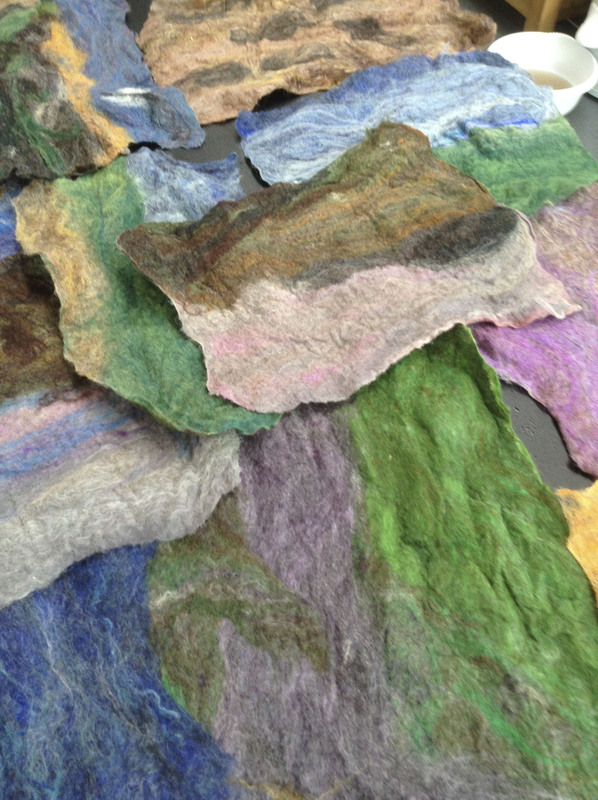 Even with Lorraine’s chirruping in the background and interruptions from her clients and customers, I still managed to produce 15 pieces of lovely felt in about 5 hours. If you’d like to have a go at making felt the old fashioned way, check out one of the video tutorials on Youtube – This is a good one. Os ydych am wybod mwy am waith ffeltio, mae llawer o lyfrau ar gael ar y pwnc. Ewch i dudalen am ddigwyddiadau ar y wefan hon (yma) i weld lle byddaf i’n arddangos neu fynd i sioe yn eich ardal chi. Ceir gwybodaeth ar weithgareddau’r IFA yma.